Is there anything better than a garlicky yogurt sauce? And the answer to this question is: No there isn’t. I use this yogurt sauce a lot for wraps, as a side for falafels, fish or veggie dishes like this or this and even as a dipping sauce for French fries or roasted vegetables. I’m not saying French fries are healthy, but this sauce is and it’s their perfect companion. So if you’re gonna eat French fries at least do it right and add some probiotic and detoxifying yogurt sauce to treat your taste buds and eliminate that guilty conscience. This sauce makes life better. It gives a grilled, cooked or fried meal that beautiful fresh and light yet fragrant contrast. Unlike mayonnaise which would make things heavier and makes you feel like you can’t and don’t want to move. 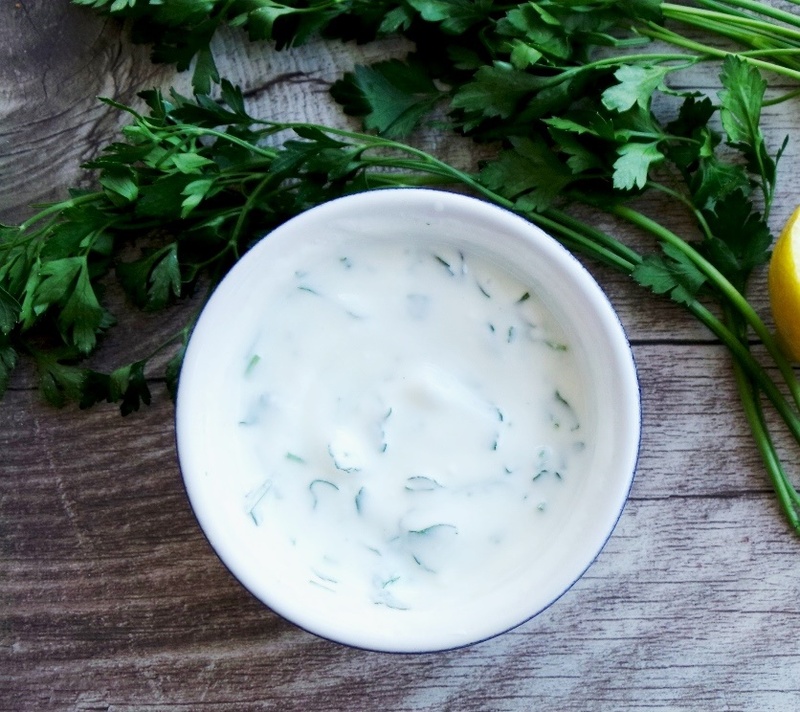 This yogurt garlic sauce is healthier and obviously a better choice if you want to lose weight, improve your skin, your gut and your overall health. All of the above are important for skin health as well. In a small bowl mix minced garlic, lemon juice and yogurt until homogenous. Add parsley and mix again. Serve with grilled, cooked or fried meals, also in wraps. This is one I would like to try…..it sounds simple and wholesome ……..I love the way you tell the health benefits of each recipe….awesome exactly what I was looking for! !